When summer arrives and the garden is full of ripe strawberries, I reach for this Strawberry Scone recipe. It's quick and easy, and makes a batch of about 12 delicious scones. This also works as a blueberry or raspberry scone recipe! These scones are especially good warm, straight from the oven, with a cup of tea. Or, for an extra special treat, let the scones cool, and serve with whipped cream. Scatter a few extra sliced strawberries on top. How's that for an elegant homemade dessert? Toss together with a fork until the mixture holds together well. 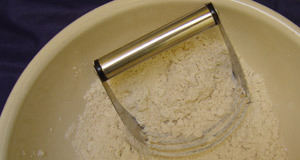 Flour your hands and use them to gently form the dough into a ball. Pull off about 1/4 cup/60 mL of dough. Place it on the baking sheet. Use another flour (spelt, kamut, white, etc.) in place of the whole wheat flour. Try using different berries in place of - or as well as - the strawberries. How about raspberries or blueberries? Blackberries? Cranberries? I save the foil wrappers from butter and use them to grease my baking sheets. Just rub the foil, butter side down, all over the baking sheet. There is usually enough leftover butter on the foil to do the job. 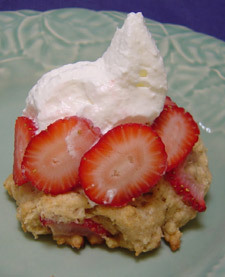 I recommend using a pastry blender when making this strawberry scone recipe. I used to think that a pastry blender was a fancy appliance. In fact, it's just a low tech set of blades attached to a handle. Return from strawberry scone recipe to easy baking recipes.